WooCommerce Subscriptions is a WooCommerce extension that allows you to create subscription-based products with recurring payments. If you are using the WooCommerce Subscriptions extension, you might also need to search and analyze your users’ subscription data and their activity. The WooCommerce Subscriptions module of Users Insights extends the default user fields, by adding the WooCommerce Subscriptions data to the user table and filters. Some of the available fields are the number of subscriptions for each user and subscription status. This module also provides the tools to search and filter your user list by various criteria, such as the subscription product that your users are subscribed to or the lifetime value of the subscribers. Another field that the WooCommerce Subscriptions module of Users Insights provides is the subscriptions statuses field. This field lists the statuses of all the subscriptions that each user has in the table. 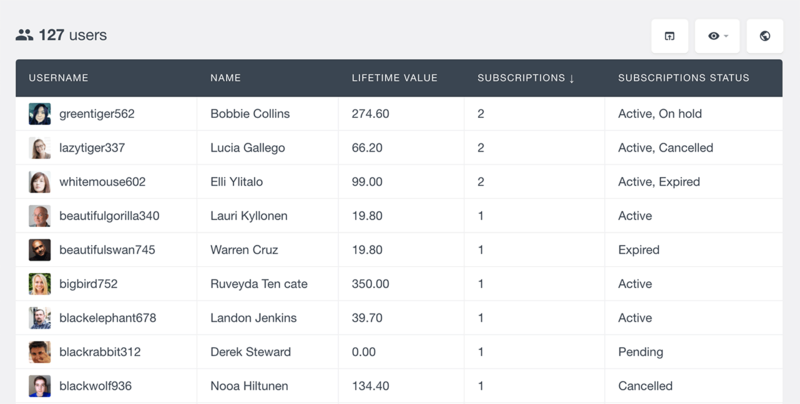 With this field you can easily visualize the statuses of your users’ subscriptions. You can use a combination of any of these criteria, you can even use all of them together. Another example would be, if your subscriptions have an end date, you can find your subscribers whose subscription is about to expire and perhaps send them a reminder or a promo code to encourage a renewal. In version 2.4 WooCommerce Subscriptions introduced a special meta field that stores the start date of the subscription in the database. This is the field that Users Insights uses by default when filtering by Start Date. For installations that update from older versions, WooCommerce Subscriptions automatically updates this field. However, if you are using an older version of WooCommerce Subscriptions or for some reason this field is not present for your subscriptions, Users Insights will default to the creation date of the Subscription (post_date field of the Subscription post). Another way to filter your users by their subscription is by using the WooCommerce module “Ordered Products” filter. When a user subscribes to a subscription product, WooCommerce also creates an order for the subscription, including the corresponding product. This means that you can use the default fields and filters of the WooCommerce module to further analyze your WooCommerce Subscriptions user data. 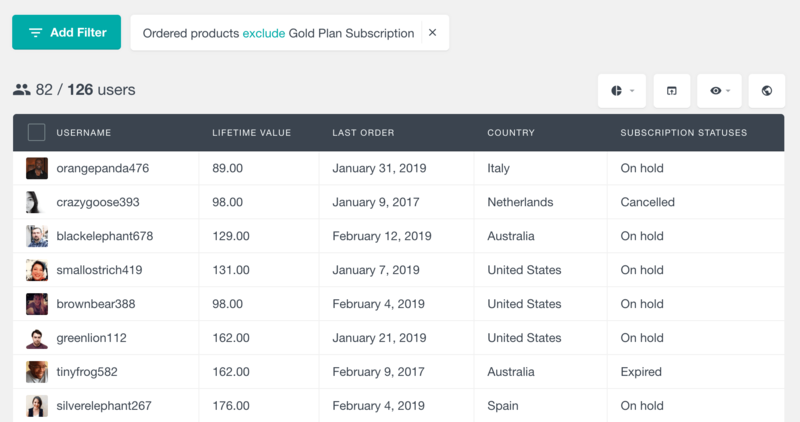 Another field from the WooCommerce module that you can use along with the WooCommerce Subscriptions is the Lifetime Value field. 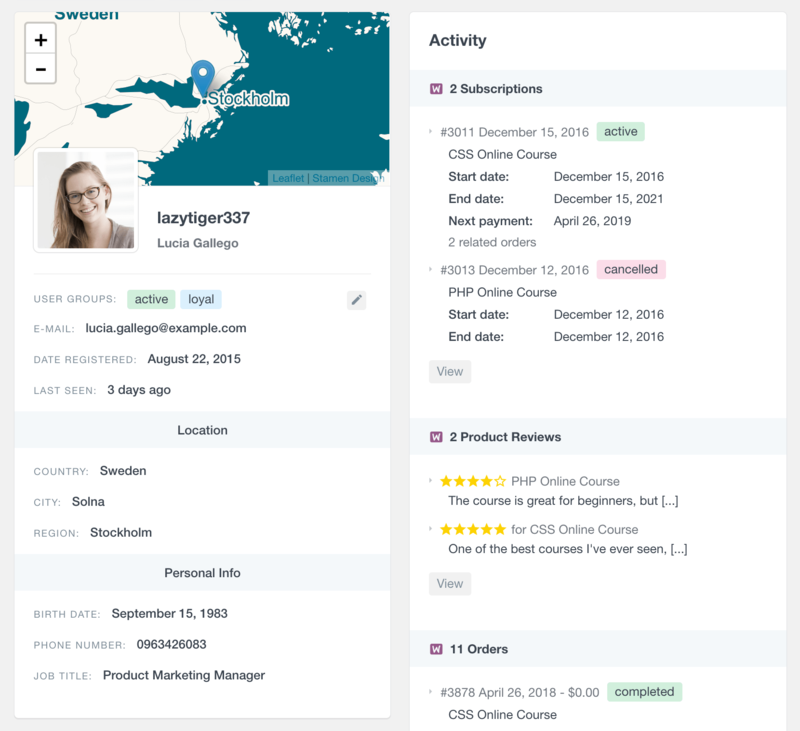 The value of this field is managed and updated by WooCommerce and is now also available in the Users Insights user table and filters. This field shows the total amount that each user has spent in the WooCommerce store, including the payments for subscription renewals. Please note that this date should be treated as an estimate only, since the payment gateway controls when payments are processed. If your WooCommerce shop consists of subscription based products only, you can use the default WooCommerce module “Orders” field to find the indicative number of renewals. The Orders field shows the number of orders that each user has made. Every time a user renews his subscription, a new WooCommerce order is placed, which means that the number of orders field can indicate how many renewals each user has had. The Users Insights user profile section also includes some details about the selected user’s subscriptions. It lists all the subscriptions of the user, including the start date, end date and next payment date of the subscription. It also includes the subscription products, the status of the subscription, as well as a link to the related orders. Each subscription links to its corresponding edit page, where you can view and manage all the subscription details. This section also includes a “View” link that links to the WooCommerce Subscriptions list, filtered to show the selected user’s subscriptions. Your user and subscription data lives in your WordPress database. Users Insights collects and organizes this data in a way that it is easy for you to manage and make sense of it. However, there are many situations when you might want to use different tools and applications to work with your user data. This is when the custom export feature of Users Insights comes in handy. The custom export feature of Users Insights gives you the tools to create your own custom user exports contain only the users and the fields that you need. For example, the results of all of the above-mentioned fields and filters can be easily exported in a CSV format. Once you apply the filters that you like and make the fields that you need visible in the table, you can just click on the Export button to export the current selection. You can then use the exported user list to send emails to those users, create reports or just to keep a record. All of the WooCommerce Subscriptions features can be used in any combination with the rest of the Users Insights features. For example, you could use the Geolocation module to detect your users’ locations. 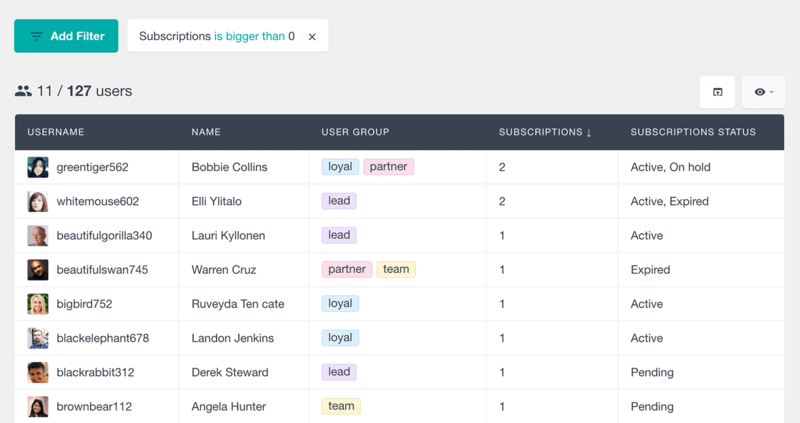 Or you could use the Groups feature to apply custom groups to your users and later search the user list by those groups. As you can see with the help of the WooCommerce Subscriptions module of Users Insights you will be able to easily search, filter and analyze your customer data. Being able to analyze your user activity and subscriptions data can be beneficial to both your store and customers in many different ways. This can help you learn from your customer data, so you can better understand your customers and improve your products and offers.